OFFERS: All session held in March/April get $50 off AND $50 off a fine art print or album pages. 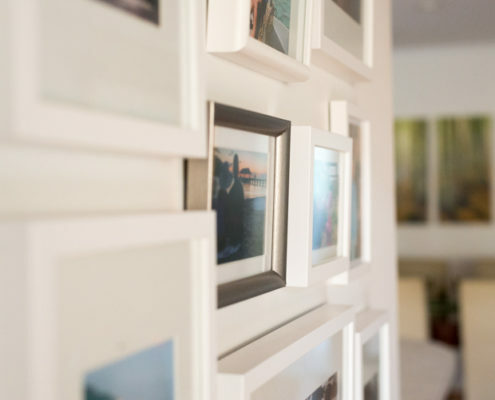 Creating a gallery wall in your home is a brilliant way to showcase the memories which matter to your family. But designing it can be a daunting process! Here are some style ideas and practical tips to help get your prints up on your wall in no time at all… well, hopefully a lot less time than it took me to create mine over the Christmas break! Such as travel, family outings, black and white images, your little one as they grow. The bathroom is a great spot for photos of the first years of your kids lives – if your space is small, then b&w is less overwhelming. I recommend creating a folder on your laptop/pc of ALL your favourite images from over the years, and shortlisting from there. 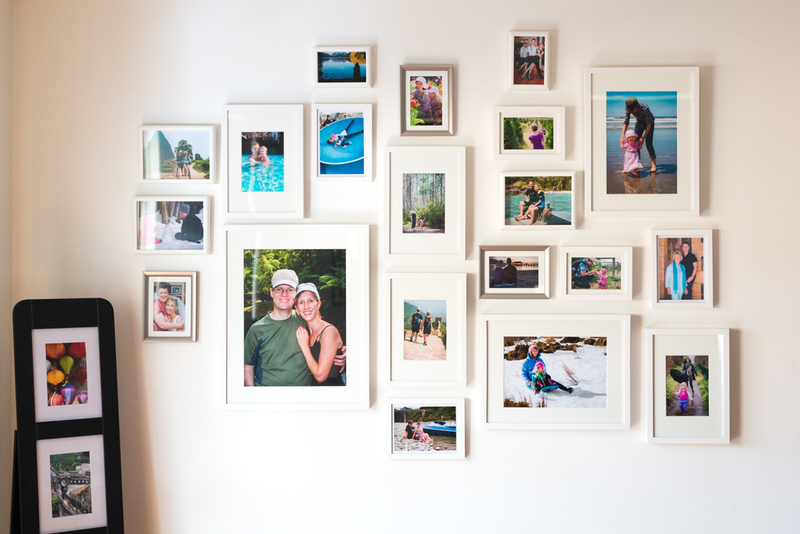 I decided to create a wall of our family adventures. From the ‘surprise’ dates we went on, to our holidays to Hawaii and China, and then all the fun traditions and outings we’ve had as a family of three. Choosing the photos was then easy, because most had to include our daughter with me or my husband, and any with family/friends were automatically excluded (except two special ones with each of our Mums). Don’t mix very formal posed ‘studio’ portraits with candid shots, these two styles have a very different mood/feeling. If your shortlist includes some photos where you’re looking at the camera and others where you’re looking at each other or at something in the scene, then make sure you include a balance of both. 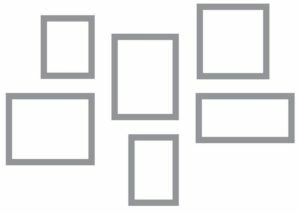 My tip is to just goggle “wall gallery ideas” and “wall gallery templates”. You’ll be spoiled for choice, and can get loads of inspiration. Grid layout: Choose this if you want clean lines, and even proportions. It’s also an easy way to exactly fill a space above a couch/bed/table. 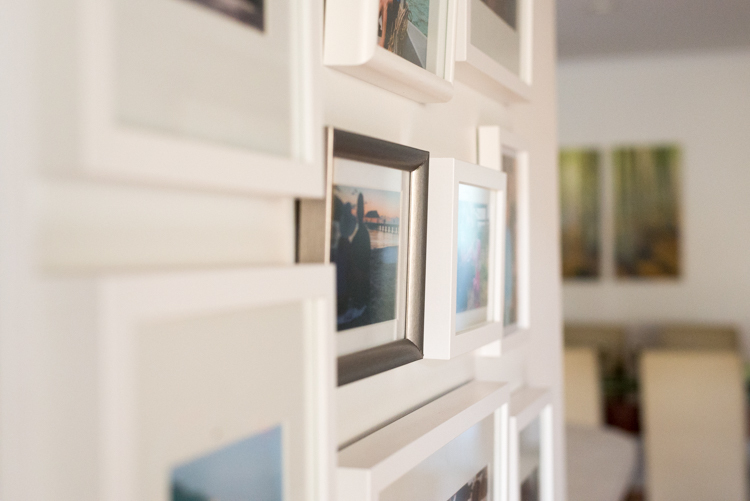 All your prints will be the same size, have the same orientation (portrait or landscape), and use the same frame. Organic layout: Choose this to add a feeling of movement and creativity. 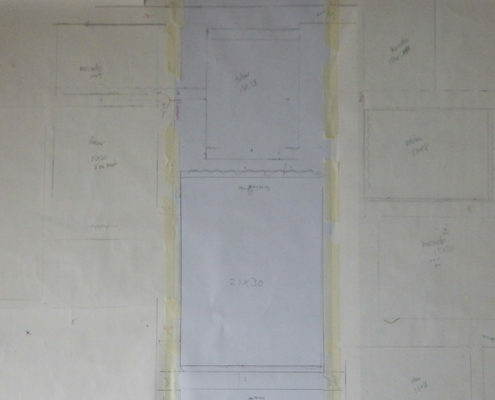 Your prints will appear to be randomly placed, but you and I will know how much planning went into it! 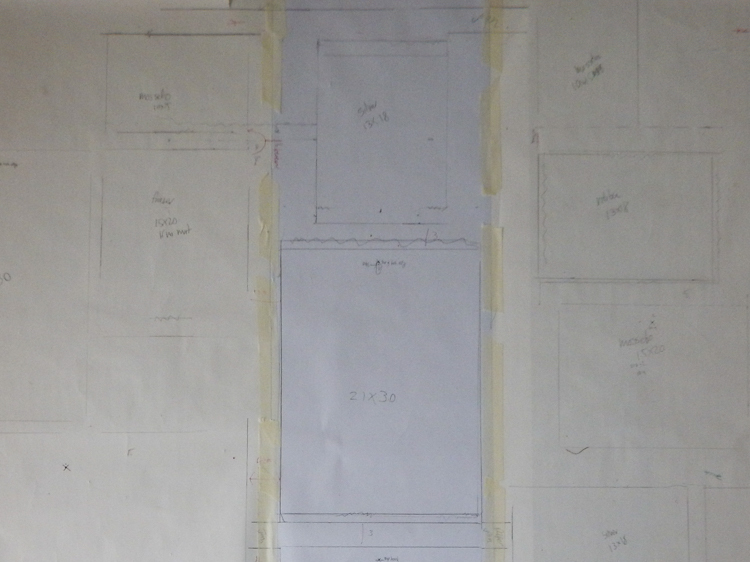 I chose an organic layout for my wall. I actually stumbled across this wall template sold at Ikea Matterby Wall hanging template, and used my savvy skills to replicate it and add a few more frames along the left side. 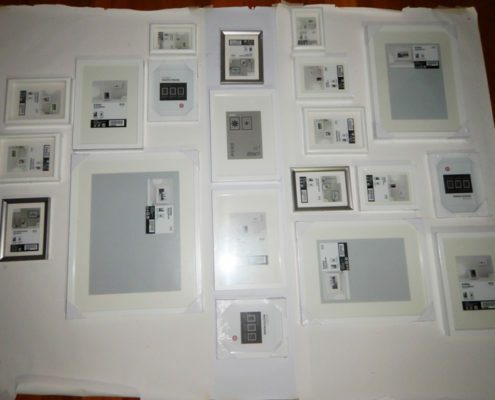 The sizes refer to the frame sizes. 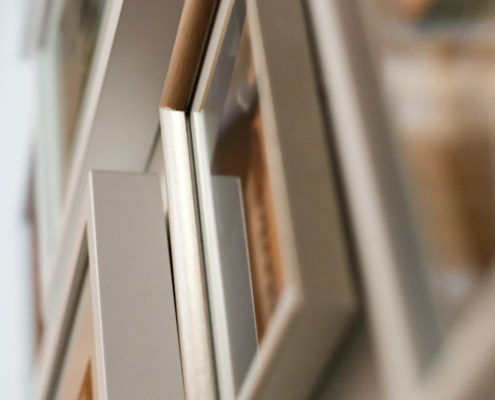 It adds depth and interest to mix framed prints with canvas, use two or three similar frames, or even include your child’s artwork and decorations. Include one or several bigger prints to give a focus and somewhere for your eye to rest on as it sweeps across the galley. I didn’t want to pay a fortune on frames, or traipse around tons of shops. I limited myself to Target and Ikea. My wall is opposite our TV entertainment area, which has a lot of black and silver in it, so I chose white and silver frames to contrast nicely. 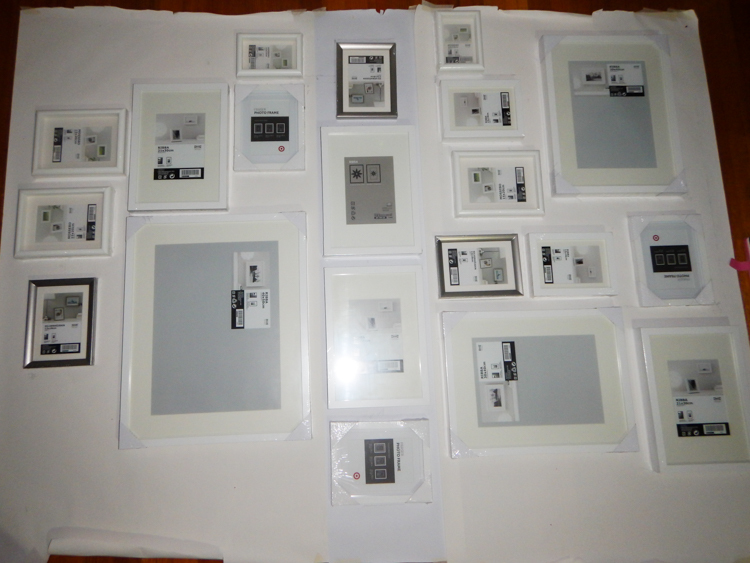 My Target frames were Fraser, and the Ikea ones were Ribba, Mossebo, and Silverhojden. The wall for my gallery is only 2.3m long, which is on the smaller size compared to most walls in my home. So the biggest print I used is 12×15″, the rest were 8×12″ and 5×7″ and 4×6″ prints. Of course, once you add a frame and mat you increase the visual impact even more. 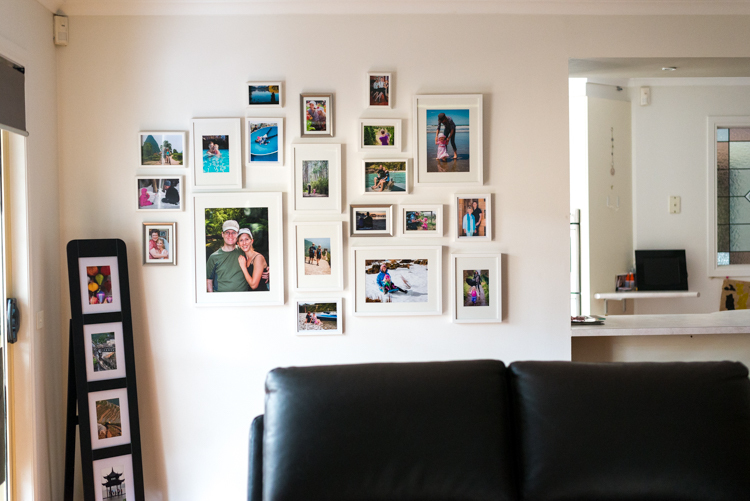 In a family themed organic layout, the largest photo should be of just you and your partner/husband/wife. You two are the anchor, all the other stories come from this relationship. 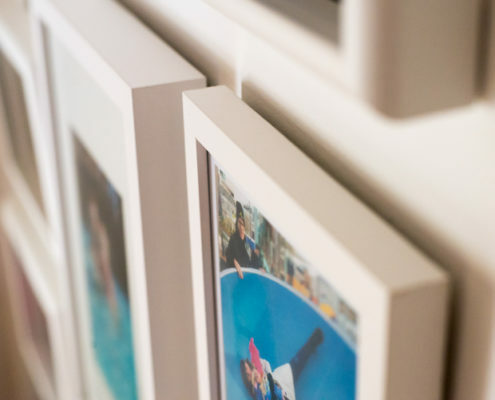 Ribba frames have a deep recess at the back, meaning none of the Bunnings wall hooks will reach the hook on the back of the frame. I’m handy with a drill so just pre-drilled and screwed in wire-hanging hooks, but apparetly Ikea sell FIXA hooks which will work. Mossebo and Silverhojden frames (and a lot of cheaper frames in other shops) use a plastic ‘glass lookalike’ instead of real glass. I didn’t realise this until I’d framed my prints and wondered why they looked fuzzy. Only buy frame with REAL glass, guys!! Luckily my framing guy was happy to cut me some glass for a few dollars! The secret to getting all your frames up without loads of misplaced nail holes! PUT THE HAMMER DOWN! 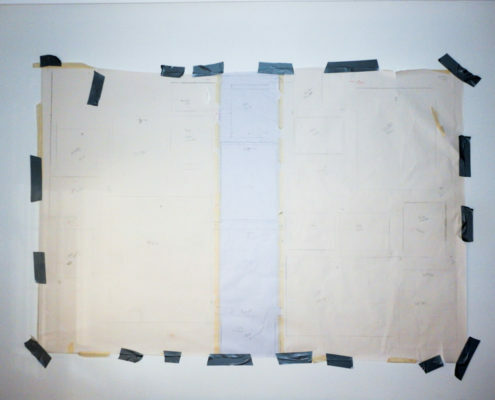 First either lay the frames on some big sheets of paper taped together, or cut newspaper to the size of each and tape the pieces to the wall. Feel free to skip some or all of these steps if you’re ok with your gallery not looking exactly what you had in mind. I’m the complete opposite and need perfection! I cut off three lengths from my toddlers extra wide craft paper roll (I think I got this from Officeworks), and taped them together on the floor in front of my wall (no overlap). 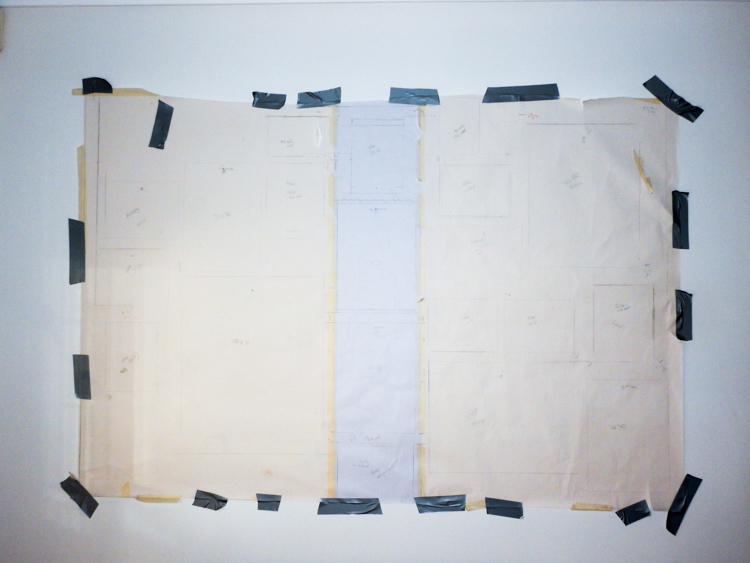 I then laid out all my frames (still wrapped) in their intended positions, starting with the largest frame, and working from the centre out. I did lots of measurements from the edge of my paper and each frame, to keep things straight, centred, and equal distance. I drew around each frame, and measured and marked where the nail hole would go. Prep finished, I used duct tape (stickier than masking tape) to stick my paper rolls to the wall. This is much easier with two people! I used a spirit level to keep them straight. All that was left to do was nail in my wall hangers, tear the paper down, and hang the framed prints – the easiest part of the entire process! 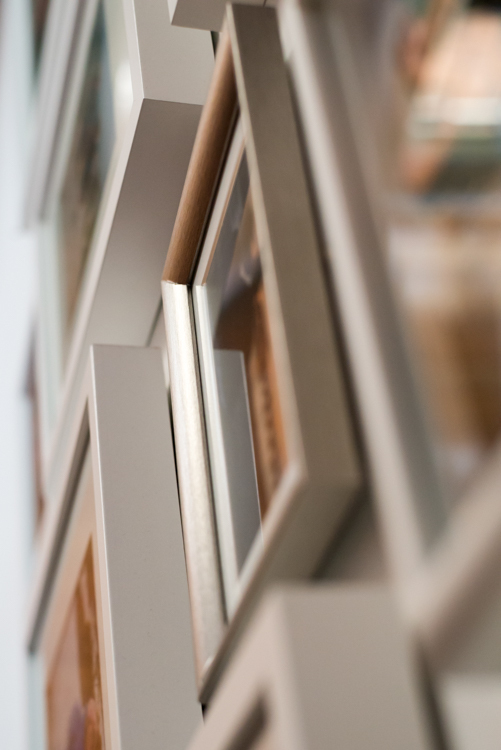 Try to keep your gallery wall at least 30cm above furniture (or stairs for a staircase gallery). My gallery was 90cm off the ground, and 30cm from the ceiling. It’s recommended to space frames at least 3cm apart to make each one stand on its own. Read Part 2: Have a love affair with my Print Lab! 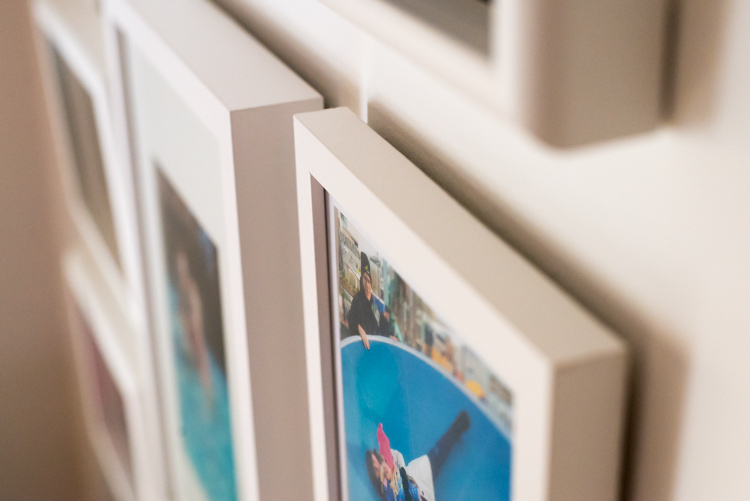 If I’ve photographed your family in the past, please get in touch to order prints for the wall gallery you create! I’ll be sure to look after you with a custom package.